The Rose Garden was shaped by the vision and creativity of Tom Gasaway, a landscape supervisor who worked discarded granite curbstones, stone steps and large concrete drain pipes into the space. He also brought in rocks from university forests. The garden is laid out almost as separate rooms; as you walk around, you will see how found items have been used both to define space and to add visual interest. 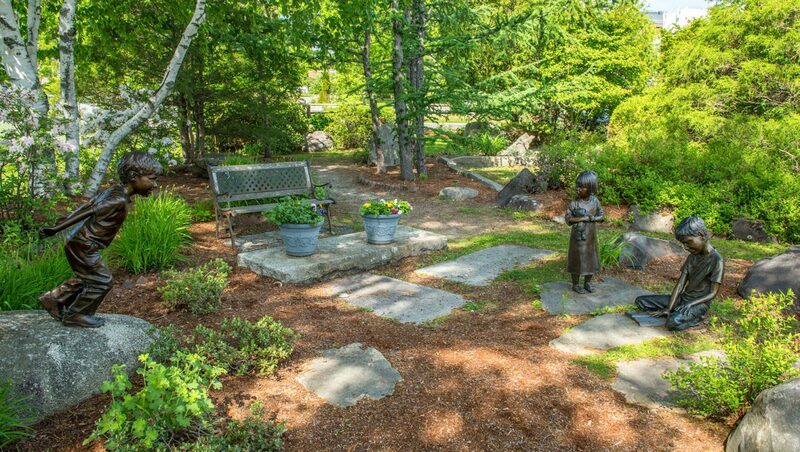 Among the garden’s special aspects are bronze castings of three young children, the grandchildren of an alumnus and his wife who gave the sculptures to the university (see accompanying plaque). The garden is a work-in-progress as other landscaping elements continue to be added such as the 2018 addition of three arbor gateways.